Yesterday was a day in the dye studio dyeing to order but I managed to have a little time to make up some new colors that have been on my mind recently. We had a surprise visit from little Arabella (she’s almost 4) where everything she’s not supposed to touch (mainly, the street out front) became “hot lava!”. These colors can also be ordered as Silk Shibori Pocket Squares. In addition, I have joined Jude’s Crazy Quilt Revisited what if? 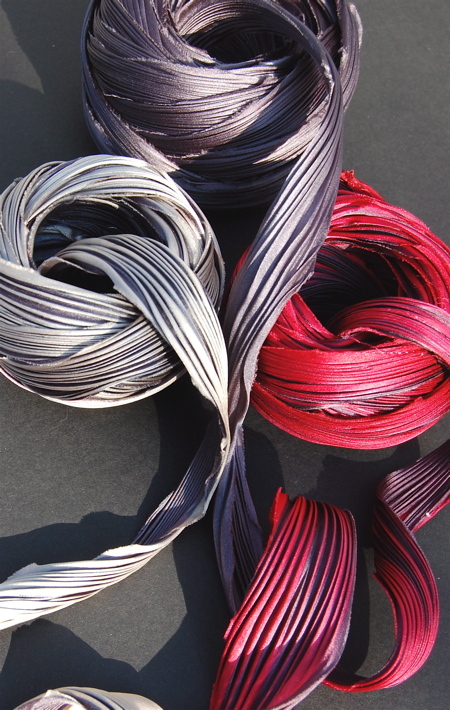 and at the moment if you are a what iffer over there and part of the CQR challenge I have 10 shibori silk scrap bags to give away to the first of you claiming them by leaving a comment here asking for one. There is a CQR flickr pool now dedicated to the blocks as they are made invented. This entry was posted in quilting, shibori, shibori ribbon, silk, silk shibori ribbon flowers and tagged crazy quilt, jude, shibori, spirit cloth, what if blog on August 29, 2008 by shiborigirl.